Two hundred years ago Kensington was little more than a country village with a resident population of around 8,000 people. The catalyst in transforming it from a rural backwater to a thriving quarter of the modern metropolis was the Great Exhibition of 1851. The driving force behind this momentous event (the world's first world's fair) was Sir Henry Cole - who was the preferred choice of no less a personage than Prince Albert, the Prince Consort, as the man most likely to actually make it happen. Albert even attempted to inject a little light-hearted Royal banter into the selection process by punning "if we want the exhibition to steam ahead we must have Cole." Desperate to be spared anymore Royal puns, the selection committee went with Albert's choice, and Cole - who Queen Victoria once referred to as "Good Mr. Cole with his rough offhand manner," - not only succeeded in staging an impressively successful exhibition but also managed to wring a huge profit from the enterprise to boot. Anxious that the surplus money should be put to good use, Sir Henry Cole pondered long and hard on what it should be spent on. Then in his Eureka! moment he decided that a Kensington Treasure Hunt wouldn't be a bad idea. But, his problem was that there wouldn't be a great deal left in the area when the Crystal Palace - in which the Exhibition had been staged in Hyde Park - was moved to a district of London that, as if fate had intended it, just happened to be called Crystal Palace! The area needed that special something if a Kensington Treasure hunt was to be at all possible, and thus Cole decided to build a series of museums around which his clues could be based! Alright, that last paragraph isn't actually true. But, what is true, is that Cole decided to spend the surplus on a series of Museums and Colleges. Thus the Victoria and Albert, Natural History Museum and Imperial College were all paid for from the profits of the 1851 Great Exhibition. This resulted in the Upper Middle Class citizenry deciding that Kensington wouldn't be a bad place to move out to, and thus terrace upon terrace of tall, spacious houses sprang up to accommodate the westward migration of around 150,000 prosperous Londoners to this new district of the Metropolis. 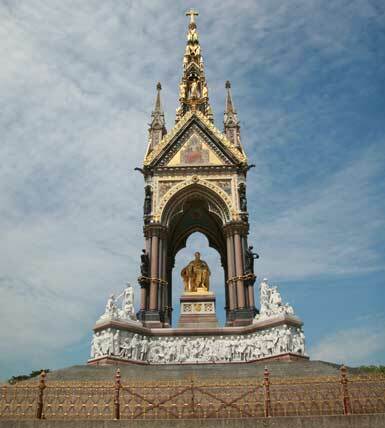 Following Prince Albert's premature death in 1861, a distraught Queen Victoria commissioned the Albert Memorial and the Royal Albert Hall to commemorate him, and the entire area was soon being dubbed "Albertropolis" in memory of the man whose vision and determination had transformed the rural village of Kensington into London's centre of culture and learning. This wonderful combination of stately museums, column-porch houses, and secret mews that survive from Kensington's more rural past make the perfect location in which to hold a great London Treasure hunt. As you weave your way through the streets of Kensington - following our cunning cryptic clues, searching for the well-concealed answers to our challenging observation questions, and pondering he puzzling solutions to our dastardly difficult Photo Challenges - you really will get to see and experience the many wondrous things that Kensington has to offer and will come away having discovered some amazing places and facts. 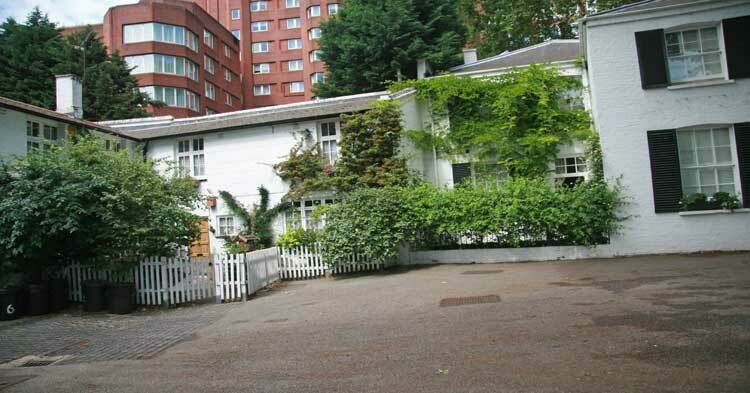 The House in which Winston Churchill died in 1965. The former home of the comedian Benny Hill. A delightfully hidden away mews in which is located a wonderfully evocative reminder of Kensington's more rural past. An almost secret square that has the distinct feel of the countryside about it and which, amazingly, is just a stone's throw from one of London's busiest thoroughfares. The former home of Sir Henry Cole who, in addition to being the driving force behind the Great Exhibition, was also the originator of the custom of sending Christmas cards. The stunning exteriors of the great museums and colleges whose construction was funded from the profits of the Great Exhibition. In addition to the aforementioned famous historical names that have found their way into our Kensington Treasure Hunt, you will also encounter the former homes of a host of famous Londoners. These include Baden Powell, the founder of the Scouts movement, the writer Virginia Woolf, the artist Sir John Everett Millais, the philosopher John Stuart Mill, and the actress Mrs Patrick Campbell, the first person to play Eliza Doolittle in the original production of Shaw's Pygmalion. Our mantra for all our London treasure hunts is that the participants do not need any knowledge of the area, nor of the history of the area, to take part. The answers to all the questions are out there on the streets of Kensington and you just need a keen eye, coupled with group curiosity, in order to locate the solutions. As for the clues that get you round the route, they are all visual clues so you just need to be able to look out for what each clue is directing you towards. But it is important that the teams actually read as opposed to simply scan the clues, as one misinterpreted clue, one only barely understood word could be the difference between success and failure on the Kensington Treasure Hunt. So, if your are looking for a great team building exercise that will be both fun and informative, why not give the Kensington Treasure Hunt a go? Not only will the teams get to work together to figure out, follow and solve a whole series of team building challenges, but they will also have great fun uncovering the secrets of and learning intriguing facts about an area of London that is truly special and memorable. Truth, they say, is stranger than fiction and, on the Kensington Treasure Hunt, you are going to come across some startlingly fascinating truths which could, to say the least, be masquerading as things that we made up. But they're all true, every one of them. The only question is - can you find them? And this is what a good team building exercise should be about. Opposing teams battling it out in some of the most exclusive streets imaginable as they try to trump the opposition in such away as to create that dreamed of Big Society in which the haves have, but the have not's can have, if they have the wherewithal to try really hard. The cost of the Kensington Self Managed Treasure Hunt Package is £140.00 for 4 packs.